We had another visitor into our Game Design Camp yesterday. 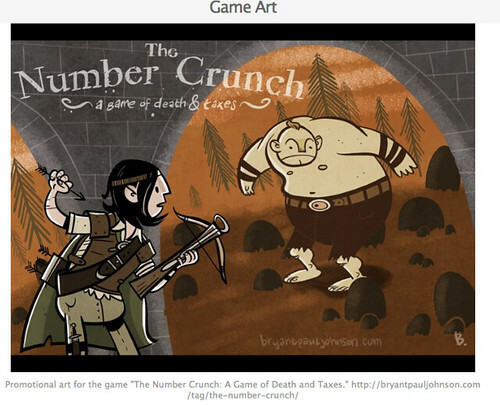 Bryant Paul Johnson is an amazing artist, webcomic creator and graphic novelist, and he has also done work in the video game industry. 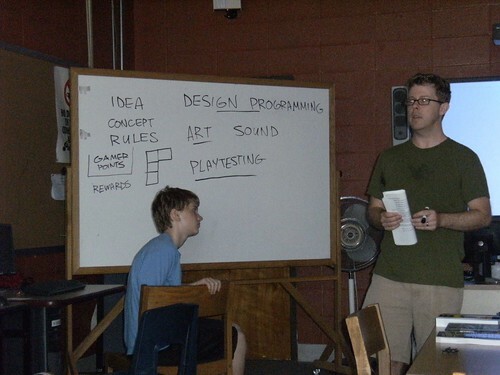 He came in yesterday to talk to our young gamers about the process of game design, although the conversation at one point turned to “modding” games, the role of the player in the modern age of gaming, and the use of cheat codes. It was pretty fascinating to hear the kids talk about things they have discovered — either by chance or by design of the programmers — and Bryant did a wonderful job of guiding the discussion. 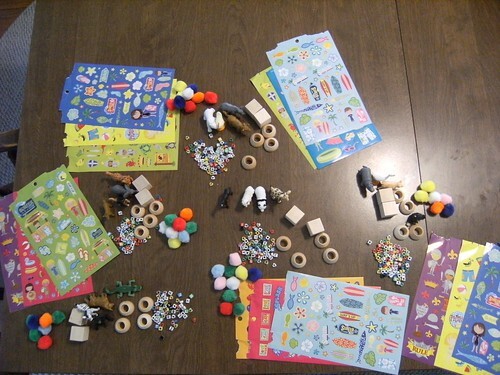 Design: Coming up a concept or idea, and establishing logical rules for game play. Bryant actually went into the idea of rules for quite a bit, pointing that games with no rules or with rules that don’t have any logical underpinning are not fun for the player. Rules — such as how you get rewards or how you lose a life — allow the player to have expectations from the game. Programming: The coding work that is the architectural underneath the game. Bryant explained that programming is the most important work you almost never see. And this is the part that takes the longest to do, too. He noted that some programmers leave various surprises embedded in the work, such as Easter Eggs, or little images or doorways or other items as a way to break up the monotony of months of programming work. Art: The graphic elements, including style and movement and flow. Bryant is an artist, so he explained to the camp how the art is the interface that users see the most (even though the code is what they play) so the artwork has to be designed to be user-friendly, but also interesting. The style of a game often comes from the art, he noted. 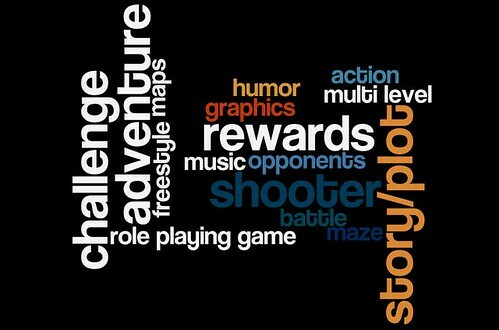 Sound: The use of music and sound effects to engage the player and shape the mood of the game. This is interesting because the computers in our lab don’t have speakers, so we’ve been playing silently. 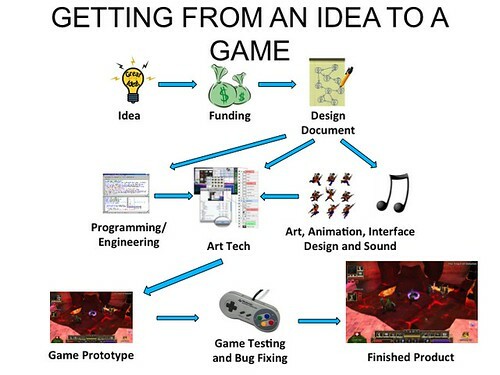 But Bryant noted that sound effects can shape the gaming experience — adding foreshadowing elements or setting the emotional response at certain levels for the user. I’ve been lucky to get visitors into the camp. They have been generous with their time and their expertise. Our Game Design camp was fortunate to have two visitors yesterday from a local game development company called Hitpoint Studios, which makes a wide variety of games (We have another visitor coming in today). Dorinda and Jerry from Hitpoint gave a thoughtful presentation about what goes on in the development of a video game, and what my co-instructor Tina and I liked most of all was how they explained all of the skills that one would need to get a job as a game developer. Dorinda and Jerry both encouraged our middle school campers to consider advanced classes in math, programming and writing in high school if they truly are interested in entering the game industry. I loved that message — that gaming is more than just playing a game. Writing and story development and collaboration are key components to developing and publishing a successful game. 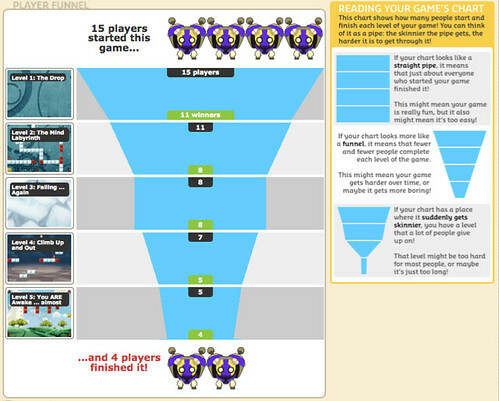 Remember that next time that gamer in your classroom asks: “Why is writing so important?” They also suggested getting into development with Flash software, since most mobile and web-based games are built in some version of Flash. Here are some of my continued reflections on our gaming camp experience. Game Camp Reflection Day One from Mr. Hodgson on Vimeo. On a notecard, we had them write out their top three favorite games (most of which I had never heard of, but I didn’t tell that to them), and then on the other side of the card, they wrote out three or so qualities of a good game. I had them think about what makes them want to come back to play a game again and again. This word cloud captures the main ideas and I have to say, I love that Story/Plot came up a few times. I think they realize that a narrative hook is necessary for a good game. This morning, we start the first day of our Game Design Camp for middle school students that is being co-sponsored by our Western Massachusetts Writing Project and a local vocational high school. Yeah, I am a little nervous because this is something entirely new and my camp partner, Tina, and I are wading into relatively unknown terrain. We actually had a very funny email exchange yesterday in which Tina was working her way through some challenges at the Gamestar Mechanic site and she thought she needed some help through a particular level. So, here I am, trying to envision where she might be as she is trying to explain where she is in the game system, and we’re both feeling like teenagers caught up in video game fever. ‘Cept it was the Fourth of July and beautiful outside, and really … video games? But they are engaging games and you do get caught up in the idea of the challenge and of moving ahead. It’s no wonder we tag the label of “addictive” to gaming at time for some kids. There’s a real tangible thrill in overcoming a level, and in Gamestar Mechanic, every level you play earns you more tools to create your own games. Play some ‘old style’ games, such as PacMan, Donkey Kong, etc. I am going to try to photo document as much as I can and intend to (if time) do more videotape reflections about the camp experience. I am never going to claim to being a hard-core gamer. I’m not. But I want the students in our Game Design program to have some sense of what it might mean to work in the gaming industry, from the inside. So, I emailed a bunch of local game companies (it turns out there are quite a few in Western Massachusetts), and while a few turned me down because they had too much work going on right now (that’s a good sign, right? and they were kind enough to respond), I did manage to invite two teams of visitors. First, my friend Bryant Paul Johnson will come in. While he is now mostly a graphic novelist, webcomic creator and illustrator for novels, he began his career working on video games. Bryant has visited our webcomic camp the last two years and really brought some interesting perspectives to the table. He is going to talk about how a game gets developed and the process that takes place from idea to production. I was tinkering around with Scratch the other day and realized that I had a project that I made FOUR YEARS AGO still sitting there. I can’t even remember how I made it but my young son had fun this morning playing with it. I know it seems odd to be reading a review of a graphic novel when all I have been talking about is gaming for the last week, but Level Up takes the idea of gaming and puts it at the heart of a intriguing story. Created by writer Gene Luen Yang and illustrator Thien Pham (Yang also did the fantastic American Born Chinese), Level Up tells the story of young man — Dennis Ouyang — whose parents dream of a future that he doesn’t want. At least, at first. What he wants to be doing is gaming. All day. All the time. What his parents want him to be doing is learning to become a doctor. All day. All the time. The conflict is there in those set of dueling expectations and lost moments of connections between parents and son, and this story has some slightly odd twists that could only be pulled off in a graphic novel, including a quartet of strange sprites who appoint themselves his guardian angels. And yet … gaming brings something to the table. Something creative, and something inventive, and something different, too. That’s the exploration I am doing — trying to figure that out. A similar struggle emerges in Level Up on a larger and more complex scale that also deals with the immigrant experience and Asian family dynamics. In the end, Dennis is able to use his fine-motor skills honed by years of gaming to make his own entry into the medical world, fulfilling both his parents’ dream for him and finding his own satisfaction. If only every gamer found that kind of calling in the world of adults ….